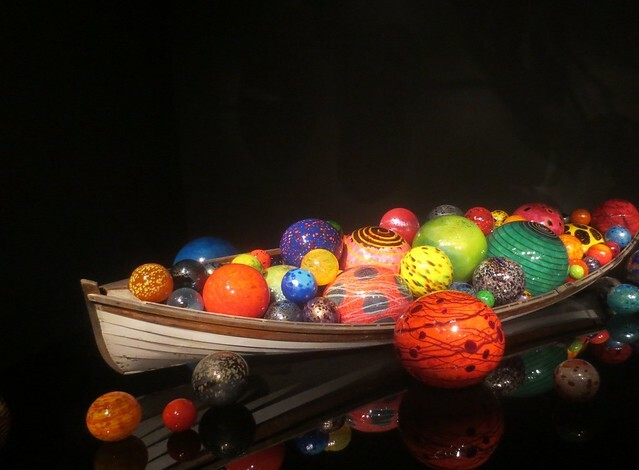 So yes, obviously my goal balls fell on the ground again, as one could tell from the fact that I posted zero times in May versus my target of three. Ah well. I have been doing stuff, just not necessarily goal stuff. 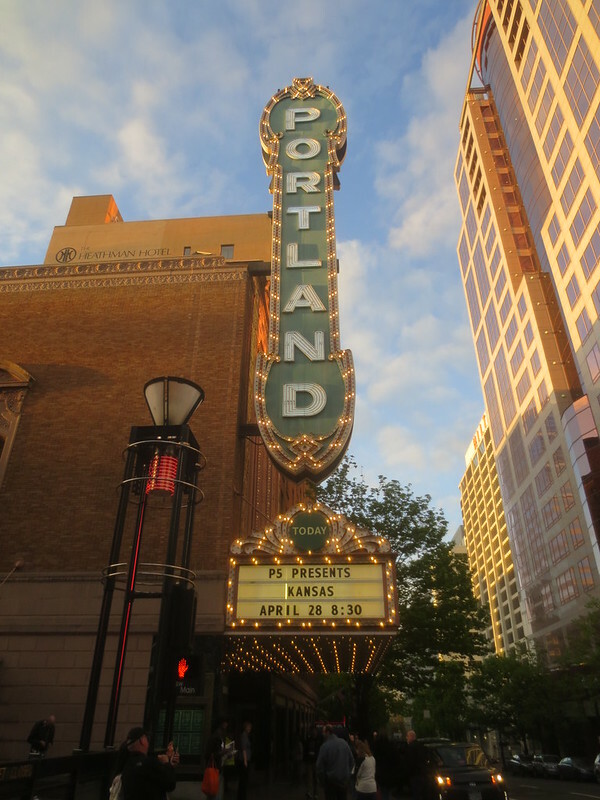 One of the things I did was take a quick weekend trip to Portland and Seattle with Mr. Karen. The main focus was going to see concerts by the band Kansas, out touring after their first studio album of new music in almost forever. We left on a Friday, not leaving ourselves not quite enough time to get there for the start of the fan club dinner, though we did arrive in time to chat with most of the folks and get something to eat before heading to the concert a few doors down from the restaurant. Mindful of our budget (and the fact that we’ve seen the band many times before), we had seats in the balcony, but still a decent view of the stage (and enough space in and around the seat itself that I felt comfortable the whole time, not claustrophobic or cramped like I sometimes get). The band was in fine form; the new members seem to have re-energized the whole crew. We slept in the next morning, had a late breakfast from a food truck, took a walk in a park to get some exercise after sitting pretty much the whole day before, and found a recycling center that would take the glass we would have had to throw out at home. 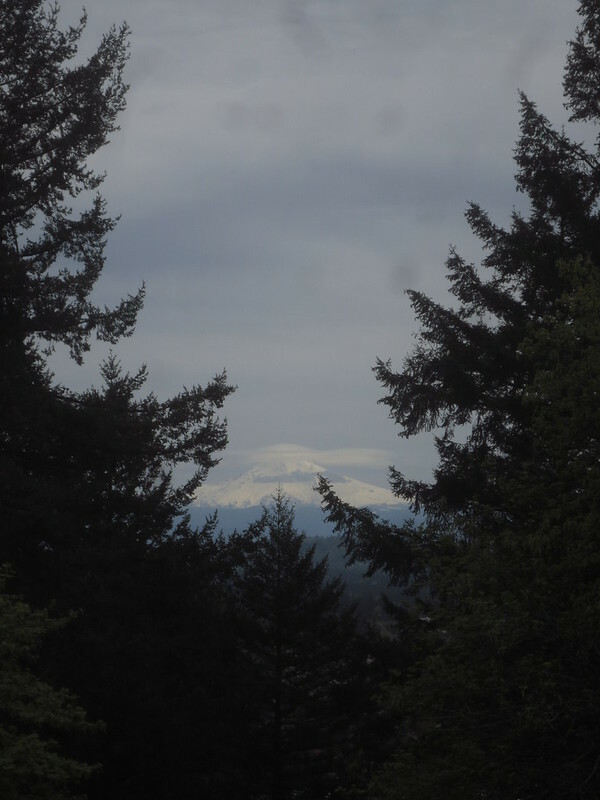 We even got some glimpses of Mount Hood. 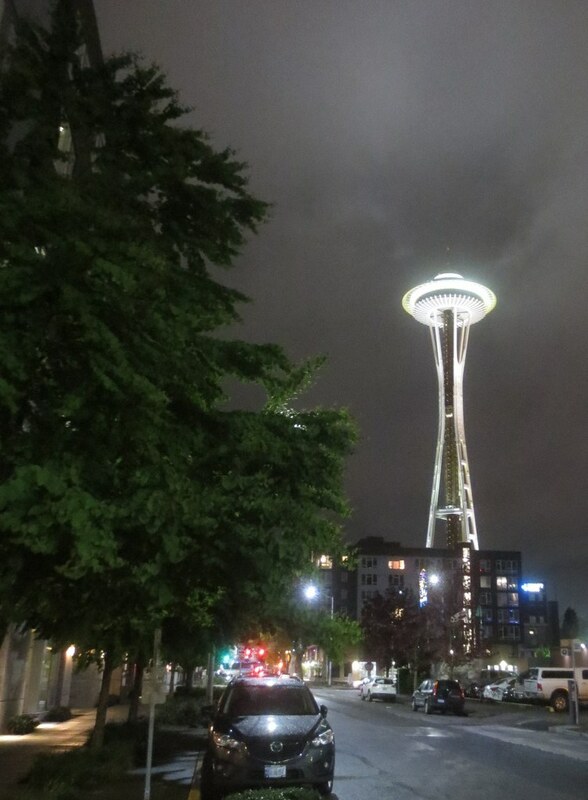 Then it was off to Seattle, just in time to check into our motel, have a fast food dinner, and walk to the venue. Our seats were once again in the balcony, a much less user friendly place than the night before, with steeper steps, narrower seats, and less leg room. 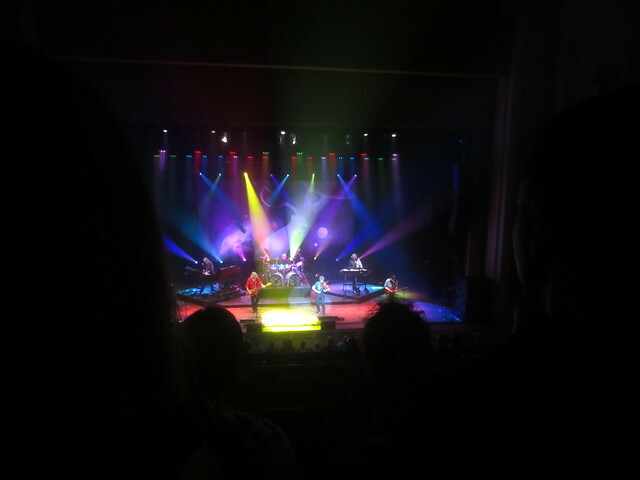 The show was still good, I just enjoyed it less due to the venue (and the drunk dude behind us who wouldn’t shut up). I did like our walk back the hotel, seeing the different signs lit up at night and the architectural details on various buildings (and even a minivan with a multichrome paint job that would make a great nail polish color). 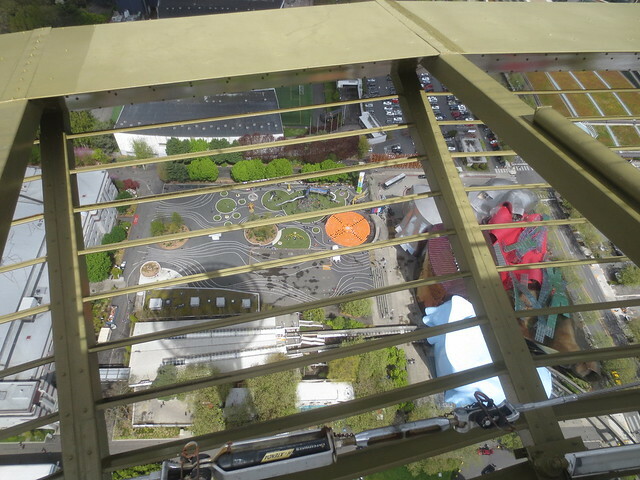 Just before we turned the last corner to where we were staying, the Space Needle loomed into our view. Again we slept in, and nebulous plans to meet up with our nephew fell through, so we made a last minute decision to go up in the Space Needle before we left town, then an even more last minute decision to add a visit to the Chihuly Garden and Glass attraction when it was suggested as an add-on to our Space Needle ticket. I liked the Needle fine; views from the top were good though it wasn’t clear enough to see the mountains, and their merchandising department is apparently working overtime, as there were so many branded items in the gift shop, from an exclusive flavor of fudge to pet accessories. I was very tempted by some of the tee shirts but I have so many clothes already I restrained myself. 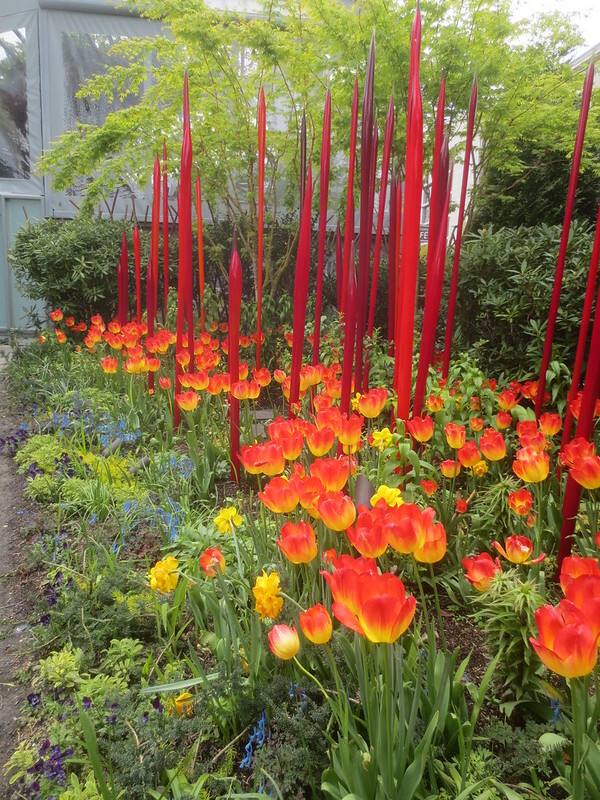 But the Chihuly, wow, that was so great to see, from the dramatic installations indoors to the melding of flowers and plants with human made art outside. I took so many photos and filled my head with so much color. There are more photos from the weekend in this set on Flickr. Thirty-eight shots from two and a half days, and that’s after I narrowed them down from way more in the camera. I’m so glad I live in the age of digital photography or I’d be broke from film developing costs probably. After our impromptu Needle/Glass visit, we drove home, the later start than planned meaning we were ready for dinner at the right time to go to a great Mexican restaurant along the way that my sister-in-law and her husband recommended. I wish we’d had more time to spend in both Portland and Seattle so I could have met up with my imaginary internet friends but this was Mr. Karen’s trip really so I didn’t want to take it over. Still, we had a good time and saw some good stuff, so it was a successful outing.